Voice your opinion! Review Harp Chartered Surveyors now. No contact with them till house was already bought therefore pointless survey- only interested in getting money. Let down on two occasions and a year on still no report. No invoice set then recieved a court date with outstanding payment!! 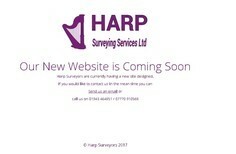 Is Harp Chartered Surveyors your company?